The other day I went to a yoga workshop with the great yogi Patrick Creelman. As I was sitting in the class, something he said really recenated with me. He talked about how we back off from things we don’t like or can’t do. It is such an obvious statement that often gets forgotten when on your on or off the mat. And it is that statement that seems to be one of the threads that is conitinuosly stitched in the patchwork of my life. On the mat, I have a fairly solid practice. Some days are more tiring than others but when my feet touch the mat I am present–except when it comes to headstand (shirshasana). I don’t like trying headstand in the middle of the room (I like it against the security of the wall) because a kind of unknowingness creeps up. The big question: what if I fall? But, it’s ok to fall. I know how to roll out of a headstand if need be. That doesn’t matter though. I back away and don’t try. Off the mat, any type of difficulty I face makes me yield and turn away from it. Growing up, things generally came easy to me and if they didn’t, I wouldn’t do it and I would simply convince myself I wasn’t good at it. Maybe though, if I put in some effort I would have been good at it. I’ll never know. What I do know, however, is that I’m not going to turn away from difficulty anymore. If I have trouble with something then I will trudge through it regardless of how long it takes me. If I fail I’ll try again. Failure won’t be something to be afraid of it will be something to be embraced and tackled. The goals I set will be accomplished. The challenges I have will be mere speed bumps and I will do shirshasana without needing the wall. Now, scones can sometimes be difficult. They can turn out hard and dry but this recipe is a great one if you’re tentative to try making them. use. Place blueberries in freezer until needed. mixture and toss with fingers until thoroughly coated. Add milk mixture to flour mixture; fold with spatula until just combined. With rubber spatula, transfer dough to liberally floured work surface. Dust surface of dough with flour; with floured hands, knead dough 6 to 8 times, until it just holds together in ragged ball, adding flour as needed to prevent sticking. with flour and chill in freezer 5 minutes. Transfer dough to floured work surface and roll into approximate 12-inch square again. Sprinkle blueberries evenly over surface of dough, then press down so they are slightly embedded in dough. Using a bench scraper or thin metal spatula, loosen dough from work surface. Roll dough, pressing to form tight log. Lay seam-side down and press log into 12 by 4-inch rectangle. Using sharp, floured knife, cut rectangle crosswise into 4 equal rectangles. Cut each rectangle diagonally to form 2 triangles and transfer to parchment-lined baking sheet. 1. Fold dough into thirds (like a business letter). 2. Fold in ends of dough to form 4-inch square. Chill dough. 3. Reroll dough into 12-inch square. Press berries into dough. 4. Roll dough into jellyroll-like log to incorporate blueberries. 5. Lay log seam-side down and press into even 12 by 4-inch rectangle. 6. Cut dough into 8 triangular pieces. Every Sunday I try and make a big Sunday breakfast because I’ve always dreamt of having those quaint moments with the family eating a nice, hardy breakfast and ruminating over the past week, the future and our never-ending dreams. We have managed to pull it off, for the most part, since the New Year. I credit this to the waffle maker my parents got me for Christmas. I love waffles and Sundays have now been renamed Waffle Sundays in our household. 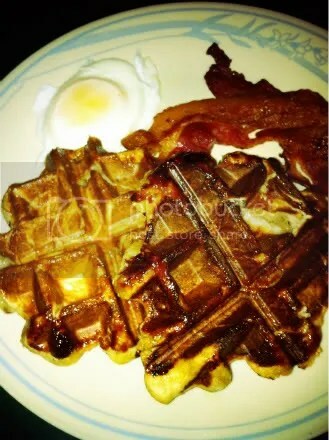 Throughout the past few weeks my husband and I have been experimenting with various waffle recipes but we seem to always come back to the Belgium Waffles I posted a couple of weeks ago. It wasn’t until today that we discovered a new recipe to add to our waffle repertoire. 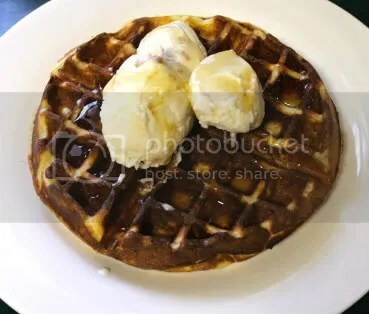 The other day, as I was searching everything waffles, I came across Waffleizer which is an insanely great website for waffle fanatics. There was a waffle recipe for cinnamon buns in waffle form. Basically, you just grab Pillsbury cinnamon rolls, crack open the packaging and then press it in a waffle iron. Since I didn’t want to go out and buy a pack of cinnamon buns I decided to make my favourite brioche cinnamon buns a la Flour. After I had waffleized the cinnamon buns I drenched them in a cream cheese maple syrup mash up. Delicious. On a floured work surface, roll out the brioche into rectangle about 12 by 16 inches and 1/4-inch thick. It will have the consistency of cold, damp Play-Doh and should be fairly easy to roll. Position the rectangle so the long side is facing you. In a small bowl, stir together the brown sugar, granulated sugar and cinnamon. Sprinkle this mixture evenly over the entire surface of the dough. Starting from the longest side farthest from you and working your way down, roll up the rectangle like a jelly roll. Try to roll tightly, so you have a nice round spiral. Use a bench scraper or a chef’s knife to cut the roll into 10 equal pieces. Place them in a baking dish and cover with plastic wrap overnight. The next day, take out cinnamon buns and heat the waffle maker. Once waffle maker is heated, place one cinnamon bun on the waffle iron and close it. The time it cooks will depend on your waffle maker. Mine cooked the cinnamon buns in a minute so I would recommend checking how the cinnamon bun looks after a minute. You want to achieve a nice golden brown crust on it. Carefully remove cinnamon bun waffle and place on plate. Smoother with maple syrup or a maple syrup cream cheese mash up. Using a stand mixer fitted with the dough hook, combine the all-purpose, whole wheat bread flour, yeast, sugar, salt, water, and the eggs. Beat on low speed for 3 to 4 minutes, or until all the ingredients are combined. Stop the mixer, as needed, to scrape the sides and bottom of the bowl to make sure all the flour is incorporated into the wet ingredients. Once the dough has come together, beat on low speed for another 3 to 4 minutes. The dough will be very stiff and seem quite dry. Somedays I wish that bartering was still an acceptable form of currency because I am a terrible business woman. I just can’t take money from people, and if I do, this weird immense sense of guilt overcomes me. This feeling has been a part of me since I can remember. Whenever I babysat, I would often give a back a bunch of the money stating that they gave me too much. And if they didn’t accept it?–Well then I would just leave it on their counter. Really, the only time I have felt ok with accepting money is when it was through working for a corporation. So, when I became a certified yoga teacher I failed because I couldn’t charge people the money. That’s also one of the reasons why I don’t like selling my baked goods. Recently, a few people have asked me to bake them some cakes which excited me. 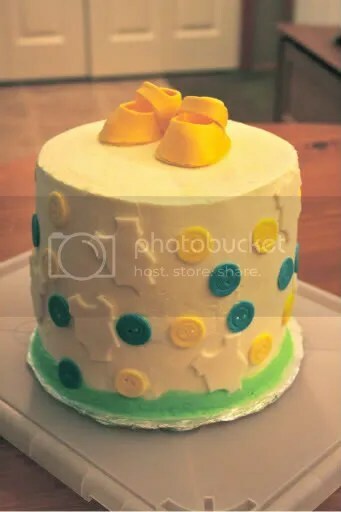 I love baking and decorating cakes and need an excuse to practice my skills without all the calories of having to eat an entire cake. The most recent cake I made was for a baby shower. She gave me creative license but wanted something baby themed. I decided to go with a button and onsie motif topped with little baby shoes on top. I wish I could make cakes all the time. I had a blast making it. The New Year has come and I am sure many of you have made resolutions–I, however, had made none. I’m doing quite the opposite actually. While most people resolve to lose weight, I am giving up on losing weight. In September 2009, after I had my daughter I was determined to lose all of the 80 lbs I gained. It’s now been over two years later and I’m still trying to lose ten more pounds and it’s not going to happen. So I’ve come to accept and frankly I don’t really care (I actually kind of care) but there is nothing I can do about it. I really don’t like dieting and a recent article in the New York Times by Tara Parker-Pope called Fat Trap made me realize any short-time diet I attempt to wouldn’t allow me to maintain my once “ideal” weight in the long run. The article basically says that our bodies fight against weight loss. If you are really adamant about losing weight the diet you choose needs to be a lifelong journey. That’s not going to happen for me especially since I got a two-in-one waffle and omelette/pancake maker. Homemade Belgian waffles are the best. These aren’t the cardboard egos I ate as a kid. These are addictive. These are drool-worthy. These are simply delicious! The recipe makes a lot of waffles so that they can be frozen and reheated for later. In a small bowl, dissolve the yeast in 1/4 cup warm milk till foamy, about ten minutes. In the bowl of a stand mixer, or using a hand mixer, beat the egg whites just until stiff peaks form. In a large bowl, mix together the egg yolks, 1/4 cup of the remaining milk, the melted butter and the sugar. Add the yeast mixture, salt, vanilla, and then alternate between the flour and remaining milk. Gently fold the egg whites into the waffle batter. Cover the batter without touching it tightly with plastic wrap. Set bowl aside in a warm place to rise until it doubles in volume, about 1 hour. I was able to make 10 waffles but the recipe says it should make 8. Sometimes I feel incredibly lonely. If I am being honest with myself, I would have to say these times occur more than normal. I think living in Whistler is hard especially being a young stay-at-home mom whose husband has been working a lot of hours. There are days in which the kids or I only see him for an hour and sometimes my oldest daughter doesn’t see him for days. I feel drained and alone. A shell of my former self. I know this is just a phase but… still. I know I haven’t written on my blog for a long time. I still bake all the time and pawn my goodies off on the unexpecting. The reason I haven’t blogged in a while is because I have the worst lighting in my house. I live right by the woods and have very few windows in the house so natural lighting is hard to come by. Thus, bad photos result and don’t help to motivate me to post. But this month is a special month. My husband is participating in Movember. When my husband decided to do this I made it clear that it couldn’t be just about the moustache. So often I find that there is this new trend of passive activism. You see it on Facebook when people post “faux-activism” statuses. An example is ones about bra colours for breast cancer, which is great to promote awareness but more needs to be done. That’s why I want my husband to not only participate in Movember to raise awareness but to also raise money. This month everything I bake will be sold by donation at my husbands work. The first baked good I made was moustache spice cookies topped with chocolate. I made a moustache template with a piece of paper and cut out each cookie. Whisk the flour, baking powder,spices and salt; set aside. Cream the sugar and butter. Add the egg and extracts and mix until well-blended. Roll dough out in between two sheets of parchment paper and cut into shapes. Place on parchment lined baking sheets and place them in the freezer for 10 minutes. Bake in a preheated oven for 9-12 minutes, depending on the size of your cutter. Let sit a few minutes on the sheet, then transfer to a cooling rack. It’s been awhile I know. I always have the intention of writing a blog post but the days become clouded with curious children exploring their way through every nook of the house, finding treasures and creating messes. Thus, the nights become a manic cleaning frenzy ending with the floors gleaming simply to await the return of sticky fingers and applesauce paintings sprinkled with flour. Right now everything seems hard. I am tired. Too tired to even give a detailed explanation of how I feel. At twenty-five-years old I am drained. I know this is unfair to say this but sometimes I feel like I am a single mother. It’s a ridiculous comparison, I realize this. But, with my husbands work schedule (sometimes working 6 days a week, sometimes working nights, sometimes working days) and no family or close friends that I can depend on the loneliness and work is overwhelming. I don’t know what more to say. I can’t even express my feelings and I’m not sure why. Am I unsure? Am I trying to repress? Am I scared? Delving into the abyss that is my inner-most self is frightening so all I can do is focus on the positive and face that monster when I feel it’s ready to be tamed. Not now. Sometime soon. So, I focus on the good, the blessings, the fortune: beaming at the thought of my children playing together and getting to experience the narrative that there lives will weave; laughing at the silliness of my husband and his unintentional thoughtfulness but smiling at the comfort and assurance of his forever love. My family is the foundation of my life and their love is rooted in my heart. In fact, my husband brought me some happiness the other day by getting my first baking job. A co-worker of his asked if I sold my baking (which I never really thought about or tried to pursue) and he forwarded her my email. 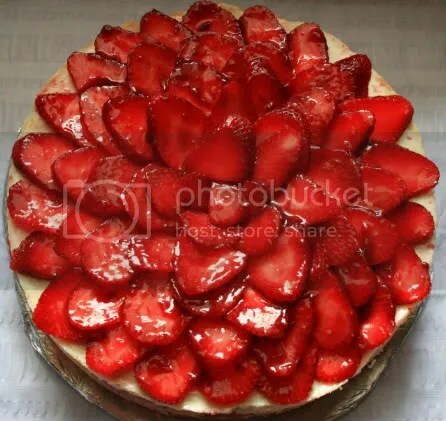 The guidelines were simple: a strawberry cheesecake that will feed four people and this is what I came up with. Position rack in center of oven and preheat to 350°F. Wrap foil around outside of 10-inch-diameter springform pan with 3-inch-high sides. Combine graham crackers, butter and sugar in processor. Using on/off turns, blend until crumbs begin to stick together. Press crumbs onto bottom and 2 3/4 inches up sides of springform pan. Bake crust 10 minutes. Transfer to rack and cool while preparing filling. Maintain oven temperature. In a small saucepan, combine strawberries and sugar set pan over medium heat. Stir strawberries and when they soften mash. Cook until reduced by half. Remove from stovetop and cool to room temperature. Beat cream cheese, sugar, lemon juice, vanilla and salt in large bowl until very smooth. Beat in flour. Add eggs and beat just until blended, stopping occasionally to scrape down sides of bowl. Spoon a layer of batter on top of the crust. Then pour strawberry filling over top gently spreading it to the sides of the pan. Pour in the rest of the batter. Bake cheesecake until outer 2-inch edge of cake os puffed and slightly cracked, center is just set and top is brown in spots, about 55 minutes. Transfer cake to rack. Cool 10 minutes. Maintain oven temperature. Whisk sour cream, sugar and vanilla in medium bowl to blend. Spoon topping over cake, spreading to edge of pan. Bake until topping is just set, about 5 minutes. Remove from oven. Run knife between crust and pan. Cool hot cake in pan on rack, Chill overnight. Release pan sides from cheesecake. Arrange slices of berries in staring from the outside, strawberry points facing out. Continue to place strawberries in a circular patter and cover completely. Stir jelly in heavy small saucepan over medium-=low heat until melted.Cool to barely lukewarm, about 5 minutes. Brush enough jelly over berries to glaze generously, allowing some to drip between berries. I am not sure about others but when I became a mother my kids became my world; or rather, my world became my kids. I wanted to be the best mother I could be which I thought meant that when they were awake I was to spend every waking minute with them to make sure that I wasn’t “failing” as a parent. Then, when they were asleep I would stay up till the late hours of the night doing housework. Failure is something I can not endure and being a parent is hard work because you have a life depending on you. If my children have difficulties (psychological, social, or physical) when they are older, most likely it is because I did something wrong as their caregiver. And what is even scarier is that there is no real manual on how to parent. There are so many theories that are in vogue one day and then discredited the next. One could push their child to excel but that doesn’t always work out for the best (ie. John Stuart Mill and his depression or William James Sidis and his criminality and loneliness). As for my parenting method; it, of course, resulted in not the greatest situation. I became overworked, tired and irritable. Happiness, or even contentment, would adorn me in moments with my children but it was fleeting. Something had to give. I had nothing for myself anymore. My husband had skiing and biking to allow him a break but I was lost. If I did something away from the house when the kids were awake a deep weight of guilt hung on to me. But, like I said something had to give. Breaking out of my comfort zone was a challenge but through the struggle came inner peace (as lame as that sounds). Running gave me independence and a sound mind; It afforded me the ability to let go of the stress. Then winter came. As the winter matured so did my cabin fever and I started to go crazy. That is when I discovered the joys of yoga. Yoga introduced me to a calmness in myself that I never thought existed. I am a self-proclamined type A personality; however, yoga just allowed me to be. In the end, I realized that the key to being a good parent is to be content and to transfer those feelings to the children. Contentment can be found in many ways, and it’s important to take time to yourself and enjoy those moments. Obviously, there are a lot more attributes that comprise a good parent but I truly believe that inner-contentment is the foundation to, not only successful parenting, but successful being. It has been a journey, but I’ve found mine. Good luck in finding yours! 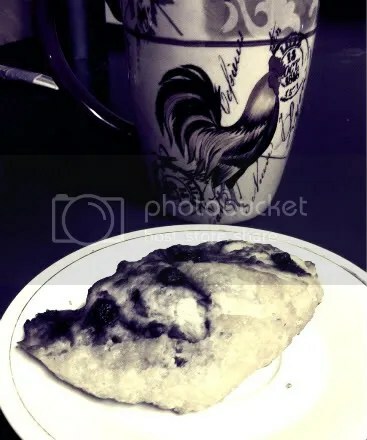 Now to today’s recipe, Pain au Chocolat (which are also known as chocolate croissants). Practicing yoga has made me appreciate the joy in little things and living in the moment. Taking the time to lament dough is one of those little moments I appreciate. I actually find it relaxing, if not cathartic, pounding the butter into a pad and then folding the dough. This recipe is from Gourmet and the pain au chocolat turned out great. The only thing I change was coating the dough with some egg wash before baking. Stir together warm milk, brown sugar, and yeast in bowl of standing mixer and let stand until foamy, about 5 minutes. (If it doesn’t foam, discard and start over.) Add 3 3/4 cups flour and salt and mix with dough hook at low speed until dough is smooth and very soft, about 7 minutes. After dough has chilled, place a large piece of plastic wrap on the counter. Arrange sticks of butter horizontally, their sides touching, on plastic wrap and sprinkle the 3 tbsp of flour over the butter. Then, cover butter with another piece of plastic wrap. Pound butter with a rolling pin to soften slightly (butter should be malleable but still cold). Scrape butter into a block and then recover with plastic wrap. Pound and roll out on both sides until butter forms a uniform 8- by 5-inch rectangle. Chill, wrapped in towels, while rolling out dough. Arrange dough with a short side nearest you. Cut in half horizontally and chill 1 half. Cut remaining half vertically into thirds, forming 3 rectangles. Cut each rectangle in half to make 2 smaller rectangles, for a total of 6 rectangles. Place some chocolate in the middle of a rectangle. Fold the two sides of the rectangle over the chocolate and then flip over so that the seam is underneath. 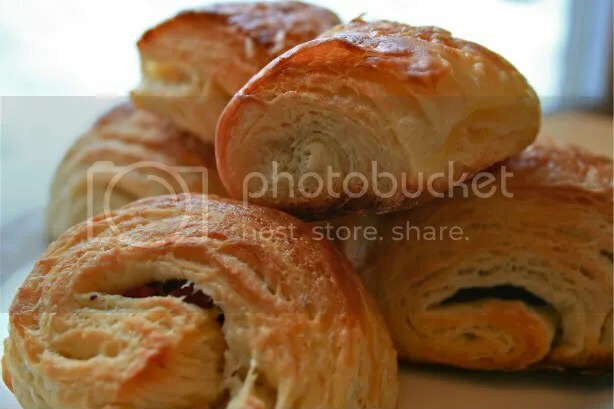 Slide each baking sheet into a garbage bag, propping up top of bag with inverted glasses to keep it from touching croissants, and tuck open end under baking sheet. Let rise until slightly puffy and spongy to the touch, 1 to 2‚ hours. Adjust oven racks to upper and lower thirds of oven and preheat to 425°F. Remove baking sheets from bags and brush egg wash on pain au chocolat. Spritz inside oven generously with spray bottle and close door. Put pain au chocolat in oven, then spritz again before closing door. Reduce temperature to 400°F and bake 10 minutes without opening door. Switch position of sheets in oven and rotate sheets 180°, then reduce temperature to 375°F and bake until pain au chocolat are deep golden, about 10 minutes more. Valentines day will be here in less than a week. People generally fall on two sides of the Valentine’s day spectrum; you have those who love the holiday and then, there are those who hate it. Well, I embrace February 14th. I think that I have said this before but I truly believe that Valentine’s day is a day to enjoy. Some people might argue that it is a hallmark holiday and I suppose one could interpret it as such. However, I view it as a day to show your loved ones how you feel. In today’s society, people tend to get caught up in activities, work and, even, play which leaves little time to vocalize the love you have for the one’s around you. At my household we don’t buy cards; we make them. There are no chocolates bought– no cakes, no sugary confectionaries, nothing of the sort. Everything we do is made from scratch and with love (I realize that is cliche but aren’t many aspects of life cliche?). So for those of you who detest Valentine’s day, I ask you to take time and express your feelings to the one’s you love. Take time. Don’t rush the process. Make yourself happy and others happy. And, that is what Valentine’s Day is about. As a special treat for my children and husband I made Mini Melon-pans. While the average North American might not be familiar with the baked good, it is quite popular in Asia. They are comprised of sweet yeast bun that is covered with a cookie like crust and, in my opinion, quite delicious. So delicious in fact that I have submitted this recipe to YeastSpotting. Happy Valentine’s Day everyone–may your heart be filled with love. Prepare Bread Dough – Place water, egg yolk, salt, sugar, bread flour, cake flour, milk powder and yeast in the pan of the bread machine (according to the sequence as stated in the instruction manual of your bread machine). knead for another 10mins. Stop the machine and remove dough from the bread pan. Divide the dough into 3 equal portions (about 120g each). With lightly floured hands, take one portion of the dough and knead in cocoa powder, until the cocoa powder is fully incorporated into the dough adding flour if dough becomes too sticky. Repeat the same for the other dough with food colouring. Leave the third dough plain. Shape each dough into a smooth round and place in separate lightly oiled mixing bowls, cover with cling wrap and let them rise till double in volume about 50 ~ 90mins. With an electric mixer fitted with the paddle attachment cream butter & icing sugar till pale and fluffy. Add in egg yolk gradually and beat until combined. Add in milk powder and cake flour. Fold with a spatula and gather the mixture to form a dough. Divide the pastry into 3 equal portions. Knead in cocoa powder, red food colouring separately into two of the portions, leave the 3rd portion plain. Divide each pastry dough into 4 smaller portions. You should have 12 doughs in total. Cover with cling wrap and leave it aside for 10 mins. When ready, remove bread doughs and give each dough a few light kneading on a lightly floured work surface. Press out the trapped air as your knead. Divide each dough further into 4 smaller portions (about 30g each) and shape into balls. Flatten each pastry dough into a round disc. Wrap each bread dough with it’s corresponding pastry dough. Wrap the pastry dough over about 2/3 of the bread dough, leaving the bottom 1/3 unwrapped. 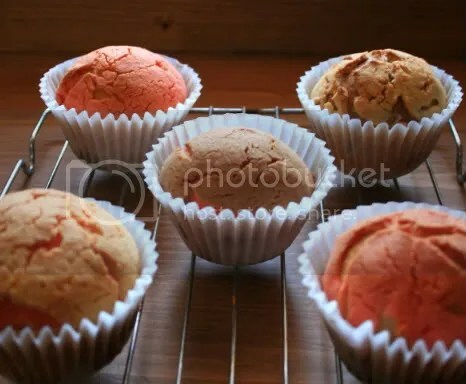 Place doughs in paper muffin cups, cover loosely with a damp cloth or cling wrap and let dough proof for 25 – 30mins or till the dough reaches almost to the rim of the paper cup. Bake at preheated oven at 375 degrees for about 18 mins. Rotate the buns halfway into baking to ensure even browning. Remove from oven and let cool on wire rack. I realize I am late but my Chinese-self still felt the need to wish everyone a happy new year. There is a reason that I wasn’t able to do a Chinese New Year post or a prior to Chinese New Years post. My girls were sick. Actually, they have been sick on-and-off since December. The details are not ones to share on a food blog but I will say that I never want the stomach flu to infect our household again. So my Chinese New Years was spent in the kitchen panicking and sweating profusely as I prepared dinner. It’s all a blur now but I can remember crying, screaming, and being so tired collapsing on the kitchen floor into deep slumber. I should clarify that those were the actions of my child/ren and not mine though the thought of throwing a tantrum and sleeping on the warm kitchen floor was tempting. Regardless of the struggles, Chinese dinner was severed (with the help of my sister-in-law and mother whom I am extremely thankful for). We had a feast of won-ton soup, cantonese flat rice noodles, General T’so chicken, sweet and sour pork, beef lettuce wraps and char siu (from BBQ Master in Richmond, BC). Oh, and, of course, my favourite staple jasmine rice. Dessert was simple yet satisfying. I made a pineapple upside-down cake for my dad who doesn’t generally prefer asian desserts. As for everyone else I made dan tats or, rather, egg tarts. Dan tats are a favourite Chinese dessert of my mother which is comprised of, generally, a shortcrust shell filled with an egg custard. They are quite simple and fast to make. Celebrate the year of the rabbit and take pleasure in the little joys of life like dan tats. Preheat oven to 350 degrees. Prepare muffin tin by buttering or spraying tins with oil. In a bowl of an electric mixer fitted with the paddle attachment beat butter and icing sugar till well mixed. Slowly add flour and mix until dough comes together. Cover dough with plastic wrap and cool in fridge for at least 30 minutes. Once ready, grab about 2-3 tablespoons of dough and flatten into a disc with hands. Place disc in muffin tin to form a tart shape. Repeat until dough has been all used. Bake the tart shell till half-cooked. This will take about 10 min. The pastry should turn white and slightly brown on the edges. 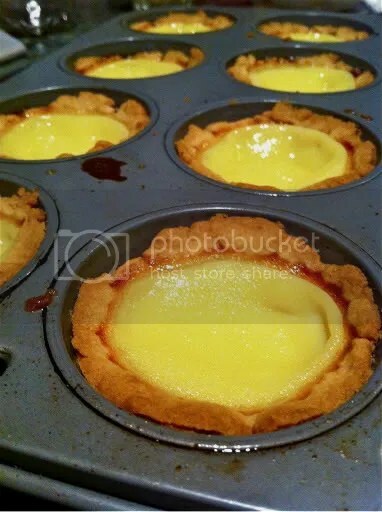 Turn the oven heat down to 325 degree in order to bake egg custard. In a small saucepan set over medium heat, stir together sugar and milk until sugar dissolves. Remove from heat and make sure milk does not boil. Whisk eggs and then stir them into milk mixture. Add vanilla; combine. Pour custard into tart shell and bake till custard sets about 20-30 minutes. Custard will be slightly jiggly when done. Remove done tarts from oven and cool on wire rack.